(CNN) -- Church bells rang throughout Australia on Sunday as the country remembered the victims of this month's devastating fires -- and firefighters braced themselves for the possibility of more blazes. 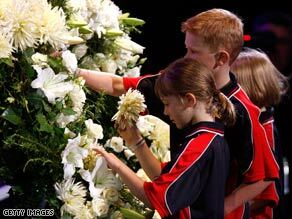 Children place flowers on a wreath during a memorial for victims of the bushfires. Even as the nation sang, prayed and laid wreaths to mourn the 209 people killed in the fires, rescuers continued to comb through rubble in search of more bodies. There are no official numbers of how many people are still unaccounted for. Weather forecasts predict another heat wave in Victoria next week, the state where the fires charred thousands of acres of land. In an interview with the Australian Broadcasting Corporation (ABC), bushfire scientist David Packham -- who predicted the recent blaze -- said conditions were ripe for more wildfires in Victoria. Officials issued warnings to residents in the state's Warburton and Yarra valleys, asking them to make preparations to leave by Monday morning. Several fires continued to burn in Yarra, known for its vineyards. "As a people, we weep for the lost," he said in a memorial, televised live. "We tend the injured. We console the suffering. And yet, our work has barely begun." "(For) what we saw on Black Saturday, what we saw at work was the worst of nature, yet the best of humanity," he added. Added John Brumby, the premier of Victoria: "We are picking up the pieces after the worst disaster in Australia's history. These fires have united all in grief." Local television stations continue to air images of abandoned communities. Busloads of residents returned home to the town of Maryville to find it burned to the ground. Tourist brochures once dubbed the town a "summer haven." "House is gone ...friends are gone ... this is total destruction," resident Simon Hudson told ABC, barely able to form words. Residents Yvone and Ivor Jones remembered their neighbors, all of whom perished. "I couldn't believe it," Yvone Jones told ABC. "This beautiful woman and her two teenage children were under the rubble," she said. "My emotion is, I guess, of sadness," her husband said. "But it reconfirms the fact that material things ... they really don't matter." In the small artistic community of Frankston, in the outskirts of Melbourne, musicians like Geoff Achison say they feel a restless urge to do something. "It is still sinking in. We are walking around in a daze with the enormity of it," he said Sunday. Achison said some of the area's best-known musicians will unite Tuesday for a benefit concert. Tickets, organizers say, sold quickly. "Like Katrina or the Tsunami... it eventually affects someone you know and love," Achison said about the fires.